If you read a comic or watch a cartoon which includes any crocodiles or alligators, you will notice that they are nearly universally green. The same applies to crocodiles in books for children, on logos or sometimes even drawings in nature books. But are crocodylians really green? 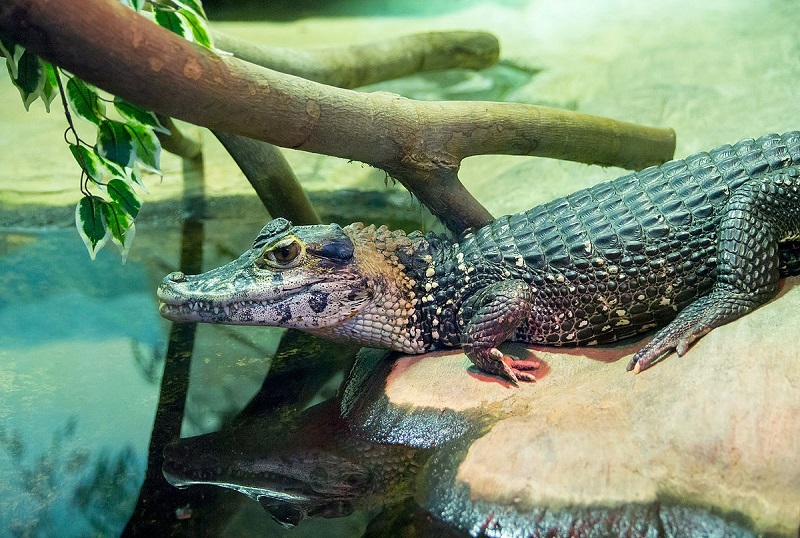 To answer this question, it is important to take a look at the various modern crocodylians which includes the crocodiles, the alligators the gharials. If you are only familiar with „normal“ crocodylians like Mississippi alligators, nile crocodiles or saltwater crocodiles, you will be possibly surprised by the diversity of colors and patterns, especially if you also take a look at the juveniles which are often much more contrast-rich than older specimens.We find near white and full black, a big range of grey, but also many shades of yellow and brown which can be even reddish. And of course there are combinations and mixes of all of them as well as fully black patterns. But what about green? This is not that easy to answer. We clearly see not a single crocodylian as green as the eponymous green lizard or the green iguana. At best we find something that falls somewhere in the range of greenish, for example in Nile crocodiles. But even here it seems to be not a real propper green but more a mix between yellow and grey that appears green. 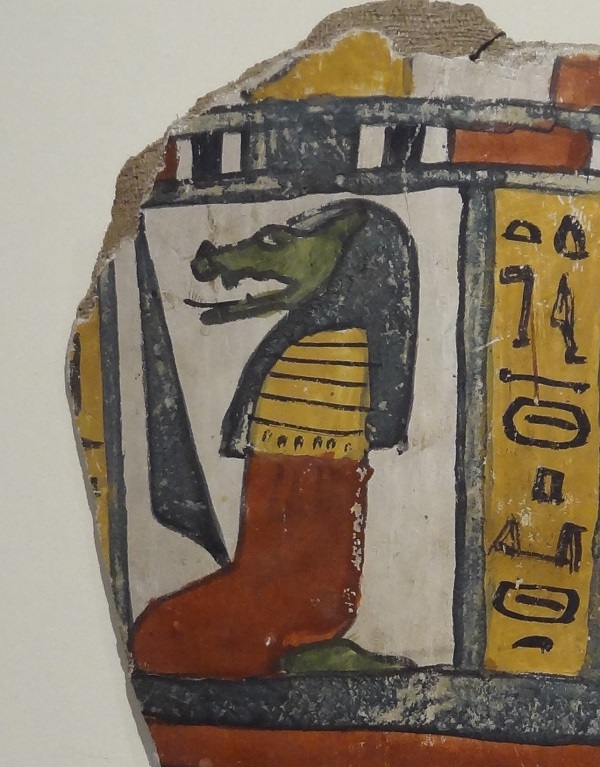 It’s quite interesting that even ancient Egyptian artists already sometimes exaggerated this to a much stronger green. Fragment of a sarcophagus of Peteamun, 23.-25. dynasty. Museum Alte Kulturen, Schloss Hohentübingen. 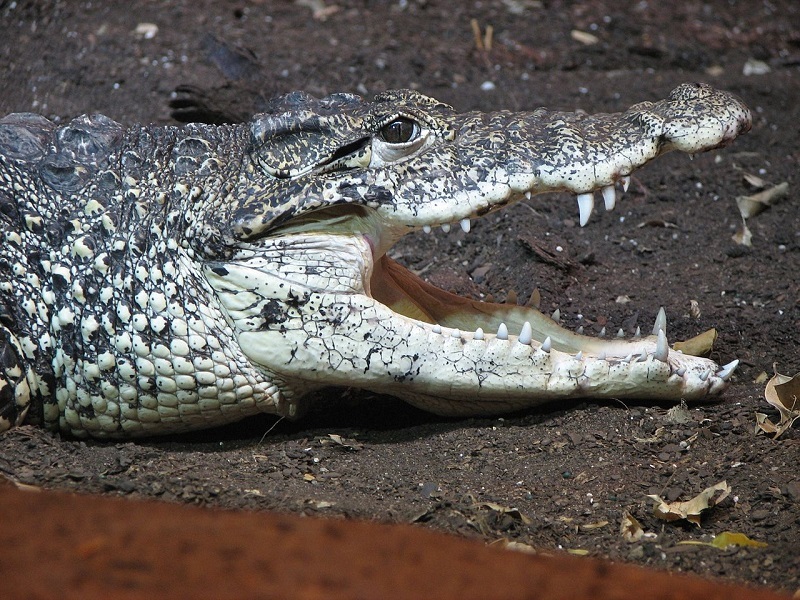 The Nile crocodile Crocodylus niloticus and the West African crocodile Crocodylus suchus were also the first crocodylians which became known to European cultures. 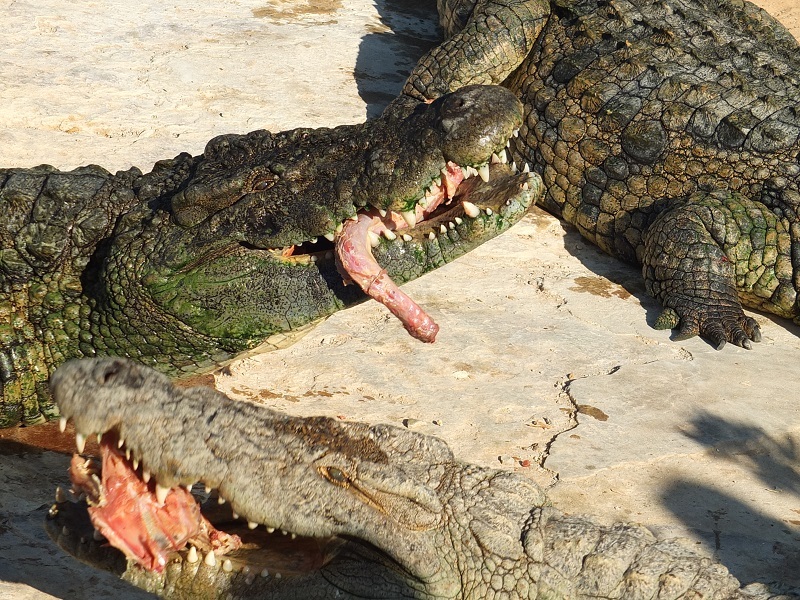 The Romans even imported some crocodiles from North Africa to exhibit them or to slaughter them in gladiator fights. We still even find some surprisingly realistic artistic depictions of crocodiles from Roman times, which were quite likely made by people who had actually either seen then themselves or had at least very good references. But besides those we find also some much more grotesque depictions as well. It’s not really that surprising that later medieval depictions of crocodylians were usually just vaguely naturalistic at best. But the green color was still a comparably common feature. During the renaissance, when cabinets of curiosities became chic, taxidermy crocodylians were quite popular items for such collections. Trading connections and the discovery of the New World and other exotic areas lead at that time to a tremendous increase of new animal discoveries and a much better understanding of the natural world. The imported taxidermy specimens of crocodylians were surely not green what makes it even stranger that the stereotype of the green crocodiles managed to persist in art. 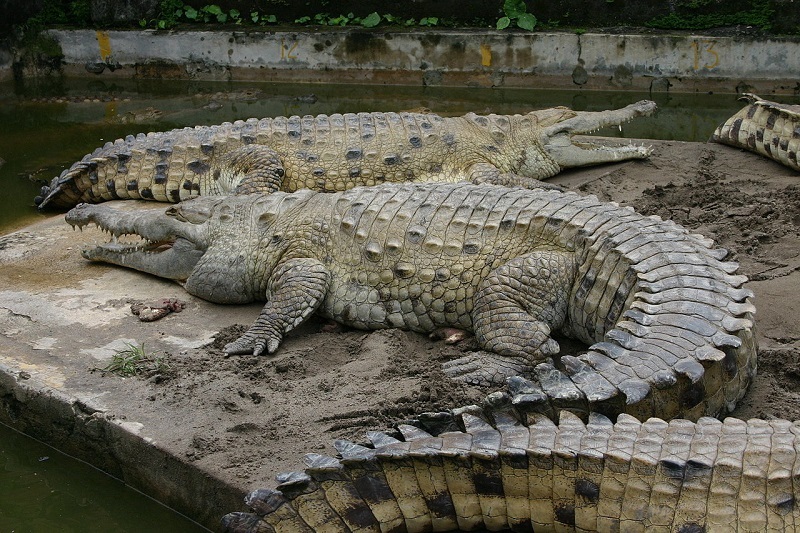 If we look at other species we find some other crocodylians besides C. niloticus which have a vague greenish appearance. But even if we keep the slight ability of color change of some species in mind, we still don’t see anything even remotely close to a real green. 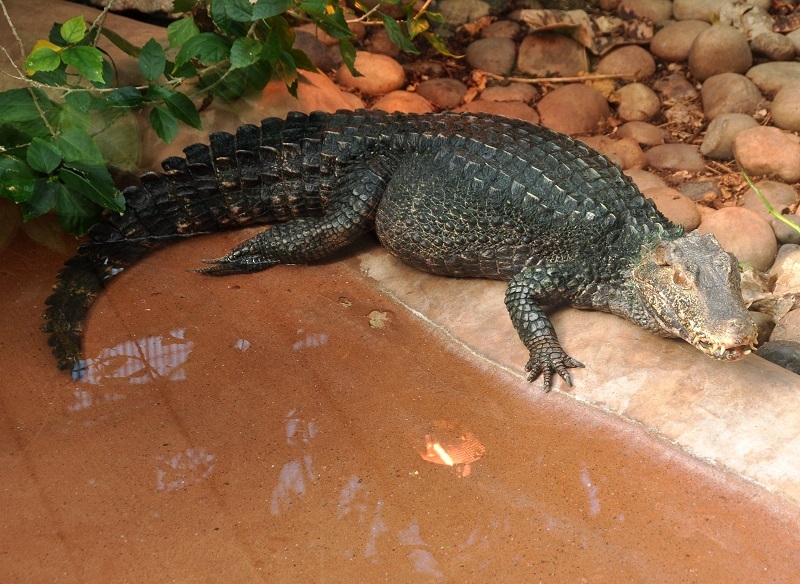 The only green crocodylians which we find in the real world have their coloration from a layer of algae. 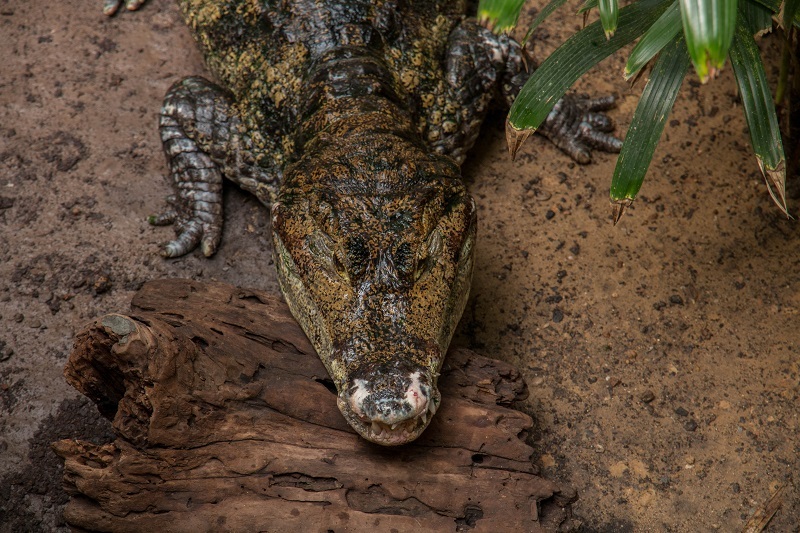 It’s hard to say how much such algae-covered crocodiles, caimans and alligators contributed to the stereotype. In some cases it’s not even that obvious anymore that the original coloration is altered by a fine layer of tiny water plants and even species which have normally not even a vaguely green touch can appear to be of that color. 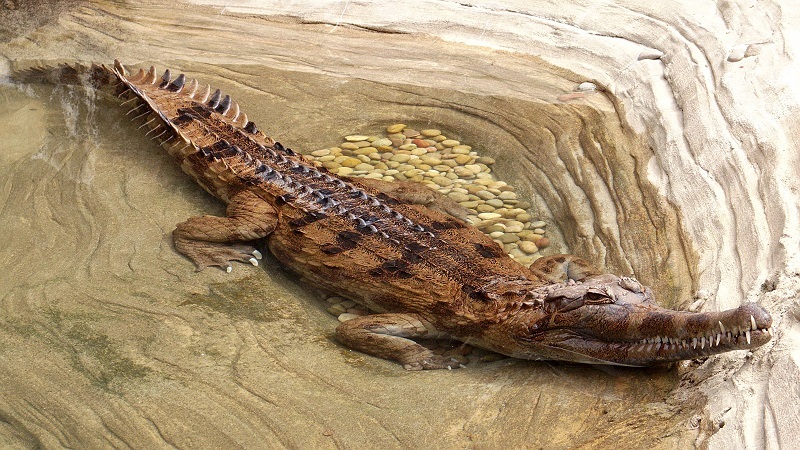 Algae-stained dwarf crocodile (Osteolaemus tetraspis), Tierpark Berlin. Normally this small crocs are of a dark blackish grey. I could imagine that this really was a factor which contributed to the cliché of the green crocodiles. Many early travelers and explores could probably see crocodylians only from some distance and usually in the water. 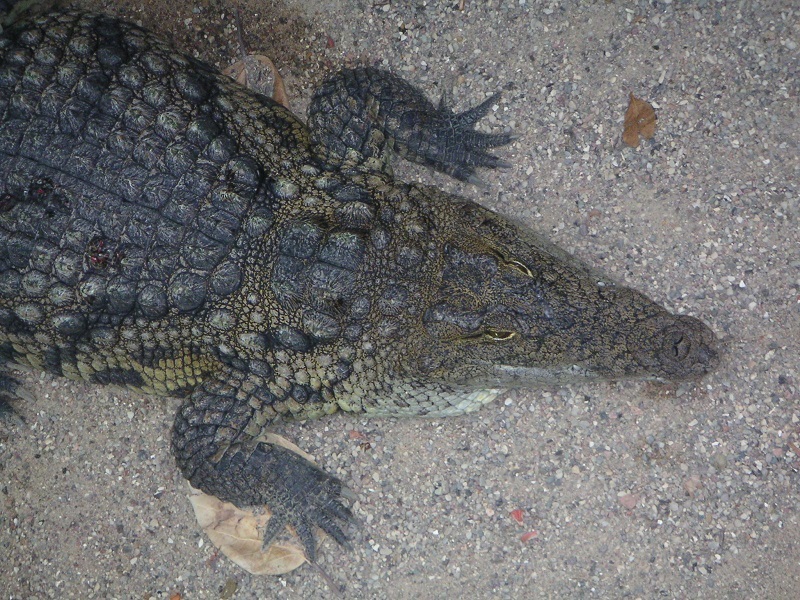 To put the initial question – are crocodiles really green – in a nutshell, I would say that some are perhaps a little bit. But yet they are still far away from the common stereotypes. That makes it even harder to understand that we still see reconstructions of prehistoric crocodylians with truly comicesque green colors. I am fully aware that we cannot rule out the possibility that prehistoric crocodylians could have had a wider range of colors, especially as they filled many more ecological niches than the remaining modern lineages. But makes it really sense to reconstruct those forms with a color we see in no extant crocodylian species? I really don’t think so. I have to emphasize here that I am refering here only to amphibious crocodylians and crocodyliformes, and not the various terrestrial forms which had totally different ecologies. On a sidenote, I am also not refering to marine forms, which had probably again quite different color schemes and patterns, but I also really doubt that any of them was green either. 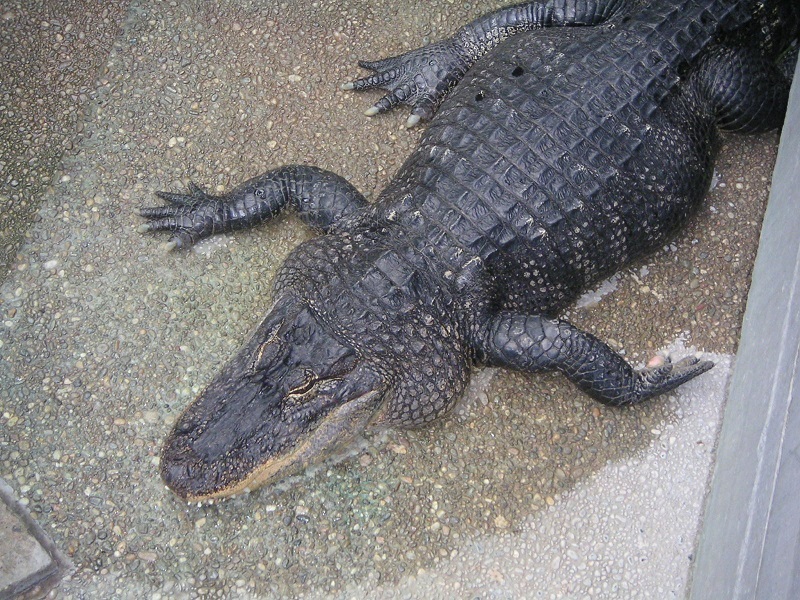 The nearly fully blackish coloration of the Mississipi alligator is quite popular among modern crocodylians. 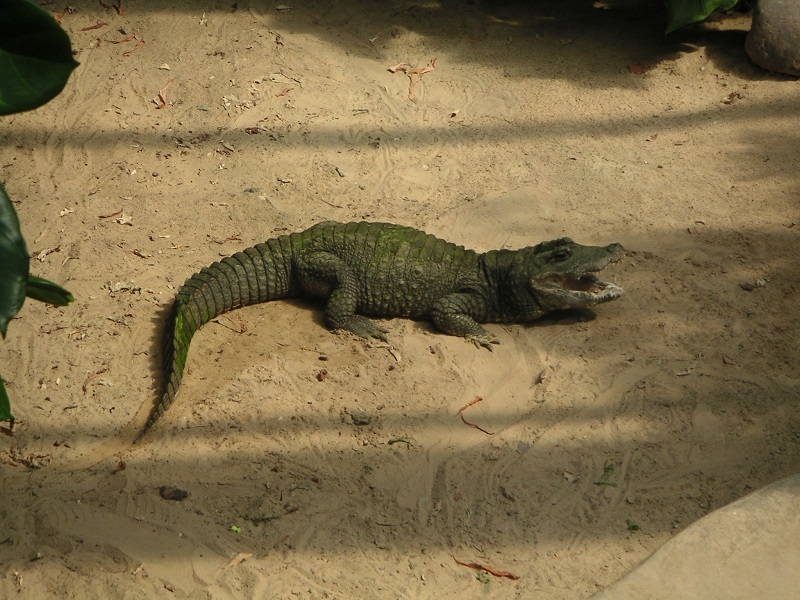 Photo taken at Wilhelma Zoo Stuttgart (but the alligators are no more on display today). The range of colors we actually see in modern crocodylians gives paleoartists already so many possibilities to create interesting new color schemes and patterns, that it’s not even necessary to include green at all. I wrote in an earlier blogpost about a certain tendency to depict marine reptiles with extremely elaborate color scheme and why this is somewhat problematic and contrary to what we see in most bigger marine vertebrates. 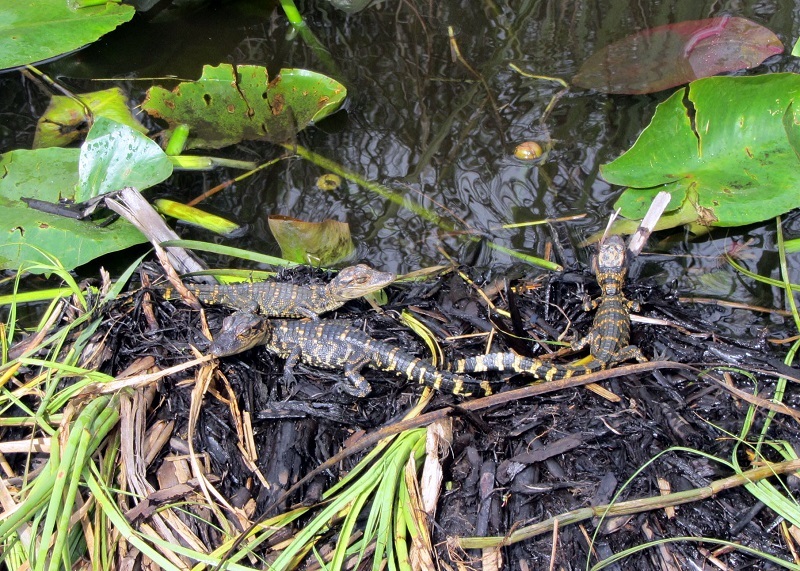 Juvenile mississippi alligators have striking patterns, quite unlike the adults. That´s something really important to keep in mind when depicting juvenile prehistoric reptiles. Wikimedia commons, Photo by AThiele. Mark Witton gave recently a really interesting and thought-provoking talk about monsterization in paleoart. This included also the importance to depict prehistoric animals not like semi-fantastic beasts but as real animals to enable people to really understand how this were once living organisms and not concept art for a sciene fiction movie. Don’t get me wrong, I really don’t say that we should now depict anything in grey, brown or yellowish colors like all the dinosaurs in the first Jurassic Park movie (except the imaginary frill of the Dilophosaurus of course…). But we should – even if we create new patterns and color schemes – still not forget to see how real animals are looking in life. 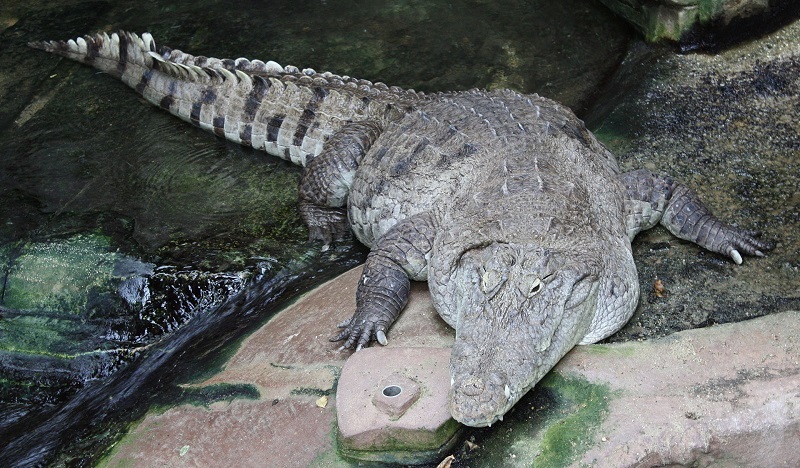 In the case of extinct crocodylians we even have the chance to see some of their relatives still alive – something impossible for many other prehistoric animals without any extant relatives. So, does it make sense to reconstruct extinct crocodylians and crocodiliformes with colors we don’t find in any extant species? Not really. Even more so when it comes to prehistoric crocodylians which actually are still comparably closely related with modern forms and share even a similar ecology. That’s why I would not reconstruct an animal like Purussaurus, Mourasuchus or any other amphibious crocodylian or crocodiliform with a green coloration which is more pronounced than the dirty greyish-yellow of Nile crocodiles. I really think there is a reason that no modern crocodile, alligator, caiman or gharial is really green, no matter if they hunt fish, turtles or zebras and no matter if they live in a jungle river, a swamp area like the everglades or a savannah habitat. I’ve seen olive green Nile and Indo-Pacific crocs. I’m not sure how much professional artists are influenced by “popular culture”, but the “green crocodile” trope seems firmly established in toys, children’s books, and the like (see, z.B., https://www.amazon.de/s?k=Krokodil&i=toys&__mk_de_DE=ÅMÅŽÕÑ&ref=nb_sb_noss, https://www.amazon.de/s?k=Krokodil&i=stripbooks&rh=n%3A186606%2Cn%3A5452736031&dc&__mk_de_DE=ÅMÅŽÕÑ&qid=1555334660&rnid=541686&ref=sr_nr_n_13). Yes, some are indeed somewhat greenish as I wrote, nile crocs in particular. But this olive green is still nowhere near the stereotypcial green often used for depcitions of crocodiles. This is luckily a not too common phenomen. But you can still see green crocodiles in many illustrations for children´s books about wildlife for example. There actually really are also some really quite green reconstructions of prehistoric crocodylians and crocodyliformes, which were in fact the main reason for me to write this blogpost.